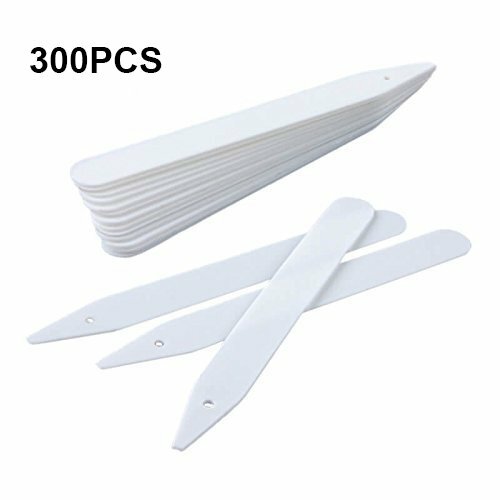 KINGLAKE 300 Pcs 4.7 Inch Thick Plastic Plant Garden Labels Nursery Garden Stake Tags White by KINGLAKE at Tulips Orchids. Hurry! Limited time offer. Offer valid only while supplies last. Product Description Plastic Plant Tags Size:Length:4.7inch.Width:0.5inch. Color:White. Stick-in pot plant label are made from Sturdy Thick Plastic. Stick-in pot plant label are made from Sturdy Thick Plastic. Plastic Plant Label is thick,stiff and easy to write on. The plant tags have little holes for tying them to larger plants. Use for recording the name of plant,date planted,etc. Package Qty:300 Pcs plant tags. 100% Customer Satisfaction Guarantee and friendly customer service. Great for marking what type of seed you plant. They really helps to remind you what's where.